For more than two years, Donald Trump was responsible for stalling long-in-the-making bipartisan criminal-justice reform legislation addressing some of the excesses of the War on Drugs and other tough-on-crime efforts of the last century. For the moment, at least, that obstruction seems to have ended. Just when a real bipartisan juggernaut seemed to be forming in the Senate to enact reforms in mandatory sentencing laws in 2016, Mitch McConnell put it off because it seemed to collide with the Trump campaign’s law-and-order rhetoric. After being elected, Trump appointed one of the Senate’s most outspoken opponents of criminal-justice reform, Jeff Sessions, his attorney general, and conservative obstruction of legislation got more obdurate. Kushner…was reportedly drawn to the subject by his father’s experience (after convictions including for tax evasion) from the wrong side of the bars in the federal correctional system. 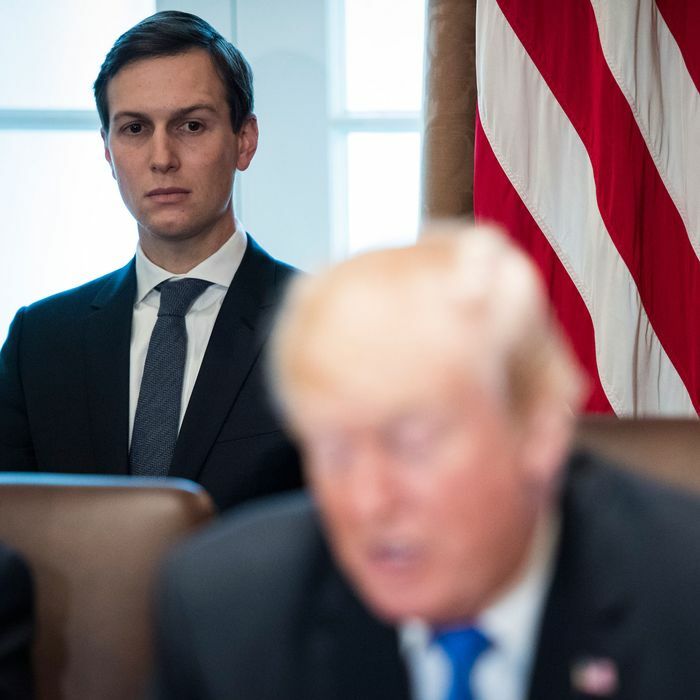 But Kushner’s angle on reform, flowing from his assignment as a sort of government efficiency czar, was inevitably focused on the more limited issue of prison operations and prisoner release policies, not sentencing. And so, with the Trump administration and its closest allies still unwilling to undertake a broader initiative, a Kushner-inspired prison reform bill — a half-loaf at best in the eyes of most criminal-justice reformers — was just approved by the House (by a 360–59 margin). The proposed compromise would lower lifetime mandatory minimum sentences for people with prior nonviolent drug felony convictions to 25 years and reduce 20-year mandatory minimum sentences for similar offenders to 15 years. But in an effort to reach common ground, that reform would only apply to new sentences and not to people already in jail. A third reform would apply the Fair Sentencing Act, which Congress passed in 2010 and reduced the disparity between cocaine- and crack-related offenses, retroactively. The final reform would expand exceptions to the application of mandatory-minimum sentences to more people with criminal histories. This deal largely quelled progressive opposition to the measure, and left as its only public opponents loudmouthed law-and-order senators like John Cornyn, Ted Cruz, and most of all Tom Cotton, famous for claiming that America had an “under-incarceration problem.” Kusnher worked on his father-in-law to overcome such opposition, but in the end Trump agreed with political advisers who pushed for putting the whole thing off until after the midterms, presumably to keep the GOP’s message as savagely pro-punishment as possible in order to excite the party’s MAGA base. Today Kushner finally got Trump across the finish line in a media event in which POTUS endorsed the First Step Act and encouraged Congress to enact it. He apparently insisted on delaying the endorsement until more law-enforcement groups signed on, and the bill’s sponsors also made some late-minute concessions to Republican senators that kept certain offenders connected with fentanyl trafficking from benefiting from its provisions. Democratic co-sponsors also probably didn’t appreciate Trump’s remarks suggesting the legislation was needed because his economic policies had created so many job opportunities for ex-cons, or his pointed reference to the “Clinton Crime Bill” (e.g., the bipartisan omnibus crime legislation of 1994) as having created many of the problems the bill addressed. The GOP leader has been loath to move the prison and sentencing reform bill for months because the sentencing reform aspect divides his caucus painfully between reformers like Sen. Rand Paul (R-Ky.) and Mike Lee (R-Utah) and the opposition of Sen. Tom Cotton (R-Ark. ), who calls it a “jailbreak” bill. So even though advocates hope Trump will endorse the bill as early as Wednesday afternoon [which he did], McConnell is laying out a steep path to passage in the Senate…. In addition to Cotton’s scorched earth campaign against the bill, Louisiana Republican Sen. John Kennedy of Louisiana has criticized his state’s Democratic governor for pursuing criminal justice reform there while weighing his own run for the office. Yes, Sessions is gone, and yes, this legislation is supported by a coalition that ranges from the Koch brothers to the ACLU. But Trump could yet decide Jared’s handiwork isn’t worth the trouble, and the bill will at least temporarily expire if it’s not passed during the lame-duck session. So today’s event was, at most, a tentative if welcome step toward First Step.